Fear Factory‘s tour bus has been involved in an accident in Germany, with all band members and crew reportedly escaping unharmed. The US metal act say they are “a little shaken up” by the incident. Posting to Facebook, Fear Factory say their bus had left the German city of Aschaffenburg on its way to Munich around 4:30am local time today, when it was hit from the front. The band don’t share many details, but have posted photos (below) of the damage, which appears to be only on the front of the bus. Fear Factory are currently touring Europe as part of their Demanufacture 20th Anniversary Tour. The band’s tour bus accident comes after Oklahoma rockers Hinder survived an insane bus crash and two drivers died in a horrific crash involving The Ghost Inside in Texas earlier this month. 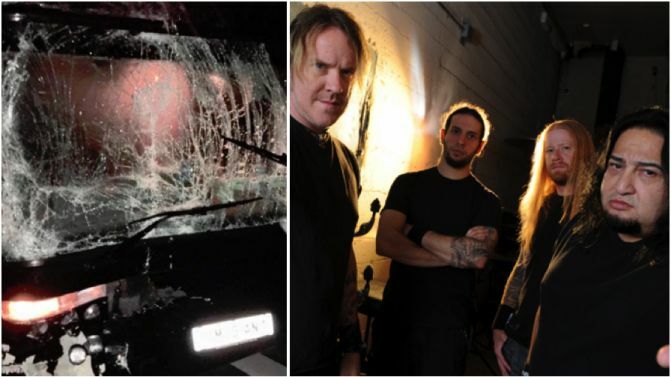 Catch Fear Factory’s full statement alongside photos of their damaged tour bus, below. We just left Aschaffenburger Germany heading our way to Munich and we were just involved in a bus crash Everyone is Ok just a little shaken up. It doesn't help when it's 4:30 am and snowing outside !